I said I was going to finish things, didn't I? 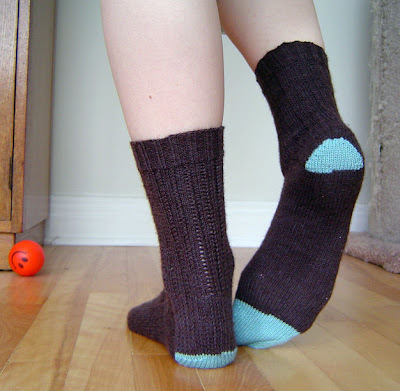 I cast on for these socks last August, and they became my portable knitting project, but then I went out to knitting night less and less, and the socks languished. It wasn't their fault. Sandra's pattern (here on Ravelry) is great, the yarn was great, and the colours are great. And now they're done, and I'm wearing them right now. Lovely! I'm a big fan of that pattern - I've already made two pairs, but since neither was for me I'll have to make at least one more. Those are beautiful! I love the little touches of contrasting color. ooh, i LOVE the contrasting heel and toes for the charades. the color is gorgeous. what a nice touch. i might have to copy you on my next pair of charades. . . 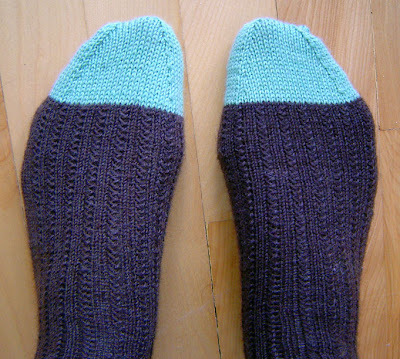 I made the Charade Socks in Koigu and I love them to bits. Looking at yours, I think I need some in a solid colour now. I loved this pattern - it really goes quite quickly once you get in the rhythm. If you could hire someone to turn pages, could you knit AND read simultaneously? Nice socks! I like the contrasting toe and heel. Oh ... I love the little contrasting heel ... very cute. Great socks, I love the herringbone pattern. My Mom is waiting for a new pair of socks. I think this might be just the right pattern. What great socks! I love the colour combo. The little blue heel is so cute! the light blue makes them super adorable! love Love LOVE the color combination! They look so cozy! Great start to the month of finishing. I find it liberating to finish up lingering projects; fewer reasons to feel guilty! Love the color combo you chose. 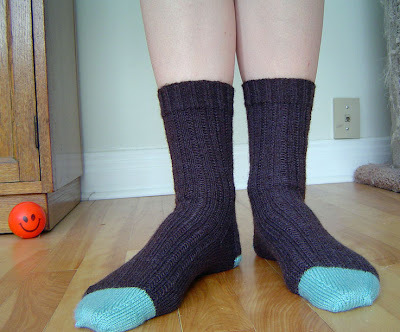 Are those the socks I saw in person at 2nd Cup when I met up with you with Sean?